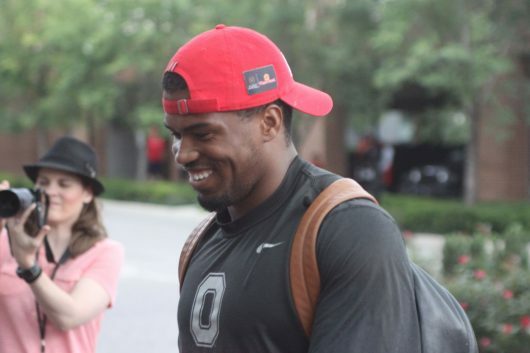 Ohio State then-redshirt sophomore linebacker Justin Hilliard walks into the Hyatt Place to check in for fall camp on Aug. 6. Credit: Colin Hass-Hill | Sports Editor. Ohio State confirmed Tuesday that senior linebacker Justin Hilliard and redshirt freshman wide receiver Kamryn Babb have sustained injuries that will sideline both indefinitely. The announcement did not come with clarification as to what the injuries were for both players. Lettermen Row reported Monday that Babb had sustained a non-contact knee injury after suffering an ACL tear that kept him off the field for the 2018 season. Ohio State did not confirm the specific injury for the redshirt freshman receiver, only that he would have surgery on the injury within the next week. According to the release, Hilliard has already had surgery for his injury. A former five-star recruit, Hilliard played in 12 games for the Buckeyes last season, accumulating 20 tackles, including a tackle for loss against Tulane on Sept. 22. Hilliard has played in 29 games for the Buckeyes in his four years with the program, recording 38 total tackles.